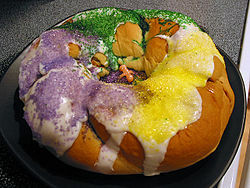 This is a recipe for a traditional king cake that anyone can make at home. Dissolve yeast in 1/4 cup lukewarm water. Set aside. Heat 1 cup of milk in a small saucepan over medium heat. Bring to a near boil and remove from heat. Add a stick of butter to the hot milk and let melt. Add 1/2 cup sugar and 1 teaspoon salt to the milk and stir in. When milk is cooled down, transfer yeast mixture to a large mixing bowl. Add the milk mixture and combine. Beat eggs well and add them to the yeast/milk mixture in the bowl. Mix well with a wire whisk. Add a cup of flour and beat well with the whisk. Add another cup of flour and beat well with the whisk. Add a third cup of flour and stir in well with a wooden spoon. (By this time the mixture is getting too thick and will get caught in the wire whisk). Add flour in small amounts and start kneading it in with your clean hands. Add 5 cups of flour in all…blending it in well. Drape a clean kitchen towel over the bowl and let rise until it looks about 3 times larger than you started out. This will take about 1 1/2 hours. Punch down the risen dough and take it out of the bowl, turning it onto some parchment paper with a little flour on. Roll the dough lengthwise like the parchment paper to make a very long king cake. Melt a stick of butter and add about 1/2 cup or a little more sugar to it, a couple of generous shakes of cinnamon, up to 1 cup of chopped pecans and a little almond extract. You can spread this mixture out over the dough, or you could use any combinations you like in a king cake. Roll the dough from the widest ends, still keeping it on the parchment paper. Loop it like a king cake and adjust it to make it look nice. Transfer the parchment paper with the king cake on it to a pan for baking. You will let this rise until nice and double before baking it…about an hour longer. Bake it at 325 degrees about 20 to 25 minutes or until nicely browned. Place a cup of powdered sugar in a bowl and add a tablespoon and a teaspoon of liquid like milk or tea, and a few drops of almond extract. Stir and drip by spoonful over king cake. Take yellow, green and purple Mardi Gras sugars and sprinkle over the icing.